If you haven't seen the Richmond Symphony perform in its mobile big tent, this weekend offers a perfect opportunity. On Friday, May 5, (5 p.m. to 9 p.m.) and Saturday, May 6, (noon to 8 p.m.) the annual RVA East End Music Festival will be held in Chimborazo Park at 3201 E. Broad St. The symphony will perform works from "Beauty and the Beast" on Friday. But the best part is that the entire event is a much-needed fundraiser for East End public schools music and arts programs, meaning your money will be going toward improving the lives of children and helping create the artists of tomorrow. 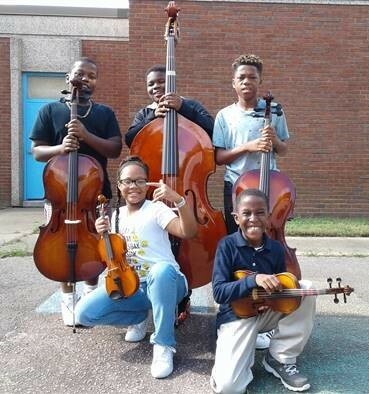 The goal is to exceed the $100,000 raised in last year's inaugural event, which had a number of tangible effects, including raising the number of violins in schools from seven to enough instruments for a full classroom set of string instruments in each school. David Fisk, executive director for the symphony, told Style that the money did far more than just purchase instruments. "It allowed us to staff after-school programs at MLK and work with 20 students all year," he says. "What we're uncovering is that there is great talent within this program. And [for some] the possibility of learning music has been the reason they want to go to school. That's why it's worthwhile to us, if we're able to pass on that love of music." Honorary heads of this year's event are Gov. Terry McAuliffe and his wife, Dorothy McAuliffe. Fisk notes that the festival would not be possible without generous support from Bon Secours and the city, as well as individual donors. Bucket donations on-site at the festival were also crucial last year, he adds. This year, an on-site beer garden will be serving Stone Brewing craft brews and there will also be plenty of family-oriented events as well as eclectic local music such as gospel, jazz and rock. At Saturday's day-long event there will be a wide variety of music and dance from the likes of One Voice Chorus, Ezibu Muntu, the Cheats Movement, Ball and Chain, Richmond Urban Dance, and plenty of students from various high schools. Also, just announced today, the symphony will be holding another festival for South Side with a performance, Dia De La Musica, on May 21 at the Sacred Heart Center at 1400 Perry St. in Manchester. That free event, which will close part of Perry Street in front of the center, seeks to raise $50,000 to support a new Summer Hill Preschool Pre-K music program, South Side Richmond Public Schools music education programs and to provide instruments for elementary schools in the 8th and 9th districts. The event will include performances by Richmond Symphony ensembles, local performing arts groups, children's activities and food provided by Sacred Heart. Fisk adds that the May 21 event hopes to lay the groundwork for a similar Big Tent festival in South Side next year.